Feminine Hairline in FFS. 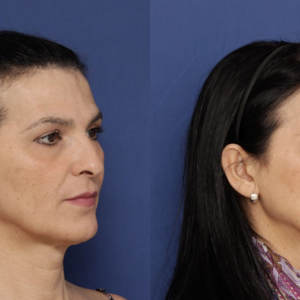 It’s easy to understand why the upper portion of the face is so important for any patient considering facial feminization surgery. After all, when we interact with other people, we spend most of our time making eye contact with them. The top one-third of the face is the part that gets seen the most, and it includes the eyes, which are the windows to the soul. It also contains two of the most important facial gender markers: the browbone and the hairline. Facial gender markers are aspects of a person’s face structure that lead other people to make judgments about their gender. There are many of them, and the goal of FFS surgery is to make masculine features appear more feminine. However, not all facial gender markers are equally important. 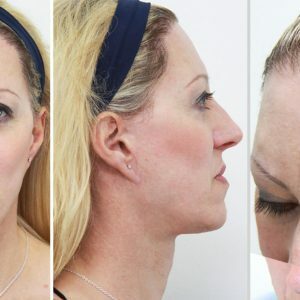 A perfect example of this is a strong, angular jawline; most people think of this type of jaw as being masculine, but it can actually work perfectly as part of a face with an overall feminine appearance. Just look at beautiful actresses like Angelina Jolie for proof of this. The hairline happens to be one of the more important gender markers on the face. Part of this is because of the effects of so-called “male pattern baldness”. But even without a receding hairline, this area of the face sends reflexive cues to others about what a person’s gender is. Several aspects of a person’s hairline communicate gender information to observers, including the height, shape, and hair density. Hairline height, meaning the distance from the hairline to the brow, is somewhat controversial among today’s FFS surgeons. It used to be widely accepted that a female forehead is smaller than the male, and so common practice was to do a hairline advance procedure to bring it forward. Comparison of hairline height before and after FFS with SHT. However, research by Alexandra Hamer of Virtual FFS shows that female hairlines are actually slightly higher, on average, than male hairlines that haven’t receded due to balding. Now, the top experts in the field of facial feminization surgery agree that most patients will not benefit from bringing the hairline forward. In fact, this procedure results in a scar along the hairline, and if it is made too low, it can actually make the face look even more masculine. Much more beneficial than adjusting the height of the hairline for FFS patients is modifying its shape to give it a more feminine look. The characteristic shape of a typical masculine hairline may also be the reason behind the misconception that female hairlines are lower. The average male hairline, before any balding has taken place, has an M-shape: lower in the middle and higher on the sides. In contrast, the average female hairline has a smooth, rounded shape, making its highest point in the center of the forehead. Because of this, the most effective way to create a more feminine hairline in most FFS patients is to redefine its shape using hair transplants. 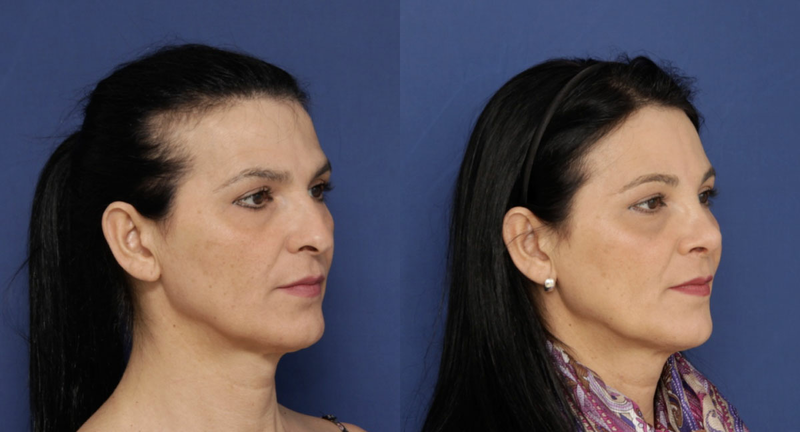 One of the most advanced hairline feminization procedures comes from FACIALTEAM, and combines these hair transplants with a simultaneous forehead reduction surgery. The benefit, of course, is that the entire upper portion of the face can be feminized in a single procedure, with no visible scarring. If the thought of hair transplants brings images of doll hair “plugs” to mind, don’t worry. Today’s specialists transfer individual hair follicles, so that the results look completely natural when the hairline has been correctly designed. In this way, the recessions near the temples can be filled in, rounding out the overall shape and creating a more feminine appearance. For patients whose hair has started to thin at the hairline due to hormonal causes, increasing the density of the hair around the hairline may be another goal of hairline feminization. This is achieved through hair follicle transplants, and the density can often be improved at the same time the shape is being redefined, depending on each patient’s case. Sometimes, when hair loss has been extensive or if the natural tips of the M-shape are particularly high, more than one hair transplant procedure may be required. Creating a more feminine hairline in FFS patients is as much an art as it is a science, and a person’s unique facial features should be taken into account to ensure the final result is harmonious and balanced. Deliberate irregularity and artistry in the placement of transplants at the hands of a skilled surgeon contributes to a natural-looking hairline. In short, the most important aspects of a feminine hairline are its rounded shape and lack of male pattern baldness. Hairline lowering surgeries, and the scars they entail, are no longer considered appropriate for a majority of patients. 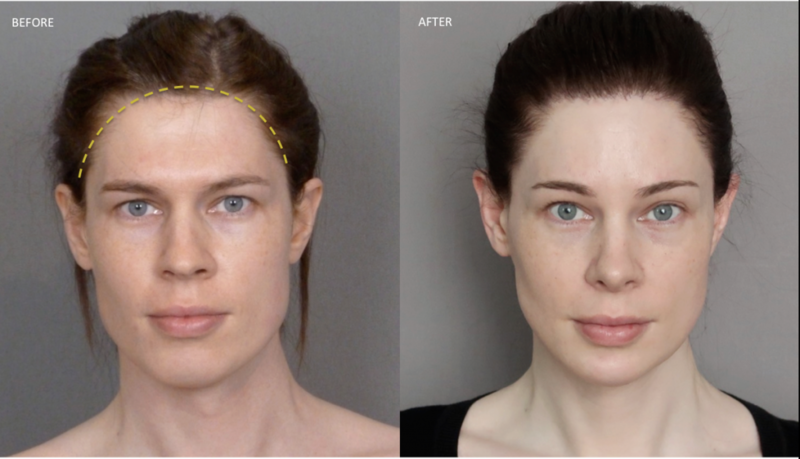 Hair transplants, however, are a very effective technique for hairline feminization, leading to beautiful, natural results.